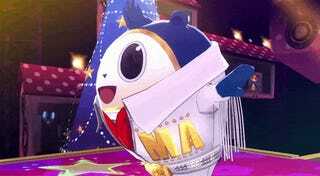 The alternative headline for this post was “Hot Blond Dancing In A Teddie,” but that would have confused our Japanese readers who know Persona 4’s mascot as Kuma. ...and all launch copies get that Vita skin, but what’s the point if we have to wait months for Nanako and Teddie co-op? I really have no trouble waiting. My summer is packed full of shows to cover and life events to partake of. I’m actually glad it’s not coming out until the fall, when the gaming scene is relatively quiet.